Thanks muchly -- of course now you've released the torrent is the perfect time for someone to point out an oopsie, isn't it? Not an error as such, but on page 37 of Navigation 47 the three apprentices are playing "pass the parcel" with their presents for their random gift exchange. The kana above their heads reads "STOOOPPP!". It fills my heart with joy with each new release. thanks for releasing this. as the person above me said, every new release from you guys (amanchu or aria) makes me happy and brightens my day. ps. anyone else having mediafire trouble? it puts me in a click to download loop..
god damnit............ I'll see about uploading the fixed single page for that somewhere later. there's a typo in chapter 48, "we all assit each other", should be "assist", right? Thinking of it, the "mysterious" episodes of Aria do not make sense, since Akari wears a satellite tracking bracelet, so she can' disappear per se. (or at least I've always assumed her glove accessory to be a kind of "digital handcuff"). > satellite tracking bracelet... really?.. That large golden ring on her glove is really inconvenient. Why would she wear it? It's probably some kind of GPS tracking e-handhuff, the 24th century equivalent of slavery? 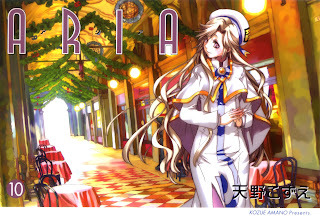 Finally today I've bought the new volume of the italian edition of Aria (it includes volumes 9 and 10).... I like your job, I'm grateful to you for it.... but I'm still an 'old reader': I like very much to have the manga in my hands! At the end of the year I'll get the last volume (11 and 12 together).... but I will always wait for your Amanchu realeses! Thank you very much again!